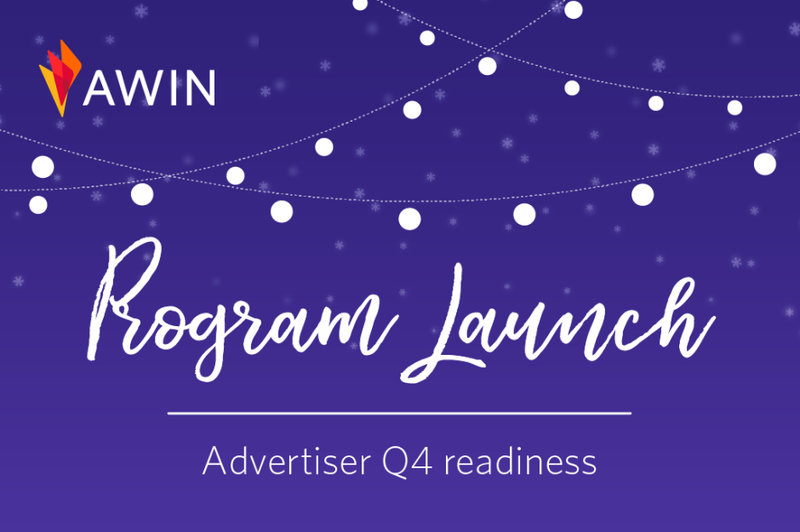 Advertisers, are you Q4 ready? As the “shop 'til you drop” mentality of the holiday season approaches, ensure you’re prepared for the biggest spending days of the year. Whether you are amid planning or have just begun, consider these tips and tricks for how to make the most of your holiday season. One of the first things to do is set up your Q4 promotional calendar. Ask yourself the following questions - 'What are you promoting and when?' 'Do I want to align affiliate promotions with other channels like email, social and on-site?' – and begin to establish your game plan. Think beyond traditional to stand out. Fill your calendar with content and information that will generate excitement surrounding your brand and products so publishers will be eager to promote. *PRO TIP: Don’t forget to communicate and advertise shipping cut-off dates to your publishers – any value you add to make their job easier won’t go unnoticed. During busy season, simple tasks like reviewing your current program initiatives can be forgotten. Here are a few items to pay special attention to before things really ramp up. *PRO TIP: Prior to Q4 kick off, become familiar with your dashboard. Make sure all outstanding items on your ‘To Do List’ are ready to go to avoid spending Q4 on basic day-to-day maintenance. 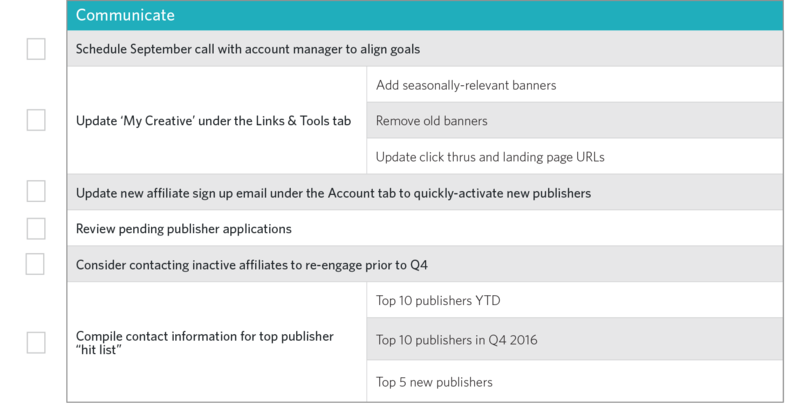 Using your dashboard to-do list as a guide, start by reviewing all pending publishers. A large number of pending publishers in Q4 can translate to missed revenue. Be sure to actively review pending commissions and publisher transaction queries so they are in line with your payment terms. If you want active and engaged publishers you need to make sure they are getting paid. Double check that your datafeed is up-to-date with in-stock products and ensure all images, landing pages, and prices are listed correctly. Consider updating your datafeed more frequently in Q4 as products are likely to sell out and prices will change. Our account managers are always here to discuss best practices for reaching your goals, but this is especially true during Q4. Keep in touch. We offer support with interface training, publisher communication and engagement, exposure opportunities, reporting and other general strategy suggestions to optimize your program. No question is stupid, we’re here to facilitate your program success. *PRO TIP: Under your account tab, review your sign-up email. This is an automated email sent to all publishers at the time of approval. Make sure this email is welcoming, informative and provides the affiliate with everything they need to start promoting right away. The more informed your publishers are, the more successful they will be at promoting what’s relevant to your brand. 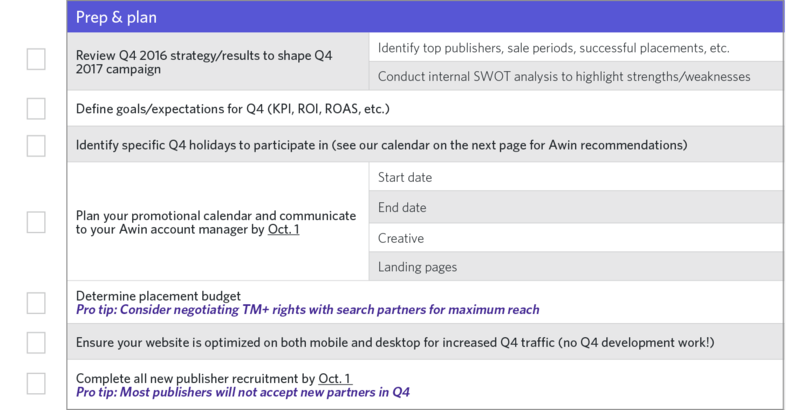 Throughout Q4 utilize Awin’s news manager to keep affiliates up-to-date on coupons, sales, products, general content, gift ideas, tips & tricks, etc. Publishers appreciate advanced notice so they can effectively plan and create content around your promotions. Please don't hestitate to contact our advertiser management team with any questions. To see our recomendations for holidays and shipping dates, click here.